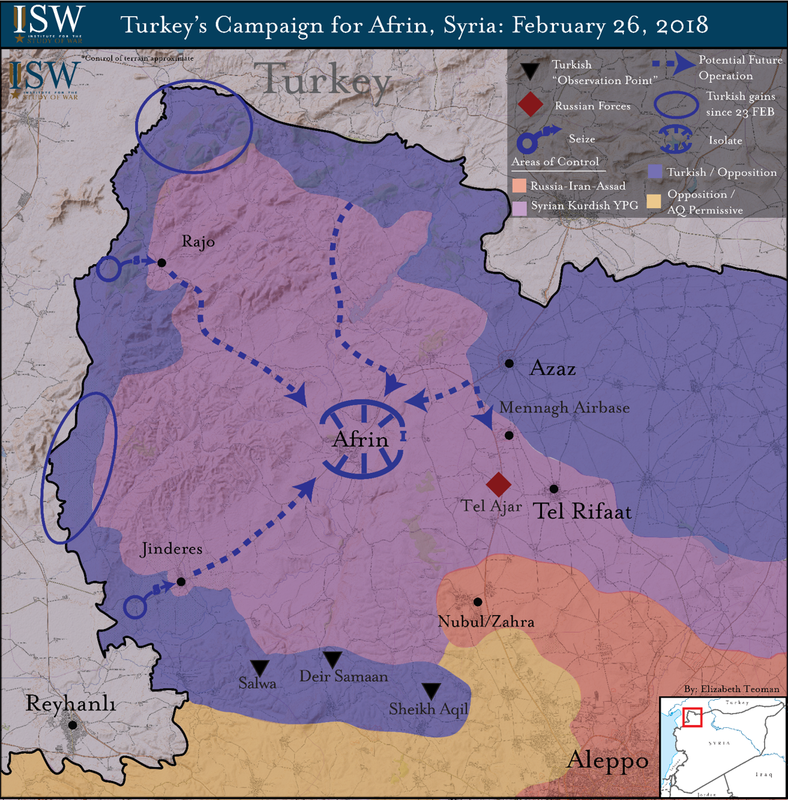 Key Takeaway: Turkish forces and Turkish-backed rebels seized the final stretch of the Syria-Turkey border in Afrin from the Syrian Kurdish People’s Protection Units (YPG) on February 26, 2018. The seizure of the border accomplishes the first of five assessed Turkish operational objectives in Afrin. The next two assessed operational objectives are to isolate Afrin City and secure ground lines of communication to the border. Turkey deployed additional forces to Syria including Turkish Gendarmerie and Police Special Forces on February 26 to continue its advance despite a U.N. demand for a nationwide ceasefire in Syria. The Institute for the Study of War assesses that Turkey also seeks to seize the Mennagh airbase in future operations and to establish a new forward line of troops with pro-Bashar al Assad regime forces southeast of Afrin City. Russia is setting diplomatic and military conditions for a pro-regime offensive to expel the opposition from the Eastern Ghouta Suburbs of Damascus. Russia shifted its air campaign to participate in an intense aerial bombardment that has killed hundreds of civilians and fueled a widening humanitarian catastrophe in Eastern Ghouta. Russia is exploiting a de-escalation zone implemented by Turkey in Idlib Province in order to redirect pro-regime manpower and assets towards Damascus. Russia remains a net driver of violence rather than stability in the Syrian Civil War. Russia is directly participating through its air campaign in an emergent humanitarian catastrophe in Eastern Ghouta. Russia and Syria dramatically intensified their airstrikes and artillery shelling on the besieged opposition-held Eastern Ghouta Suburbs of Damascus, killing more than four hundred civilians and targeting at least five hospitals on February 18 - 22. Kremlin Spokesperson Dmitry Peskov denied that Russia or its allies in Iran and Syria are responsible for the violence, stressing that all three states are engaged in an “absolute war against terrorism” in Syria. Russian Ambassador to the UN Vasily Nebenzia also accused global media of spreading “disinformation” regarding the situation in Damascus. ISW nonetheless confirmed airstrikes in nearly every opposition-held district of Eastern Ghouta by Russia on February 19 - 21. Russia also reportedly delivered large quantities of aerial munitions to the Syrian Arab Air Force at the Dumayr and Sayqal airbases outside Damascus on February 20. Russia remains culpable for the current humanitarian suffering in Eastern Ghouta. The Russo-Iranian Coalition is setting diplomatic and military conditions for a pro-regime offensive against Eastern Ghouta. Russian Foreign Minister Sergey Lavrov warned that pro-regime forces could “deploy the experience of freeing” Aleppo City to Eastern Ghouta on February 19. Syria reportedly deployed at least ten warplanes and reinforcements including the elite Syrian Arab Army (SAA) Tiger Forces to the outskirts Eastern Ghouta on February 17 - 20. Russia similarly deployed at least eleven additional warplanes to the main Russian airbase at Bassel al-Assad International Airport on February 22. The reinforcements from Russia included four Su-25 ‘Frogfoot’ Ground Attack Aircraft and four Su-35 ‘Flanker-E’ Air Superiority Fighters as well as two prototype Su-57 Stealth Air Superiority Fighters. Russia simultaneously impeded a draft resolution ordering a thirty-day ceasefire in Eastern Ghouta at the UN Security Council on February 22 - 23. Russia has attempted to further muddy the debate and justify its actions through allegations of “relentless shelling” by “terrorist” groups in Damascus. The Russo-Iranian Coalition has enabled its escalation in Damascus through a corresponding de-escalation in Northern Syria. Russia shifted its airstrikes away from frontlines in Eastern Idlib Province and Southern Aleppo Province after Turkey moved to implement the terms of a de-escalation zone previously brokered by Russia, Iran, and Turkey at the Astana Talks. Russia began shifting its air campaign after Turkey established two observation points in Eastern Idlib Province on February 5 and February 9. Turkey established a third such observation point in Eastern Idlib Province on February 15. Russia also deployed military police to enforce the de-escalation zone near the town of Hadher in Southern Aleppo Province on February 14. Russia nonetheless sustained its airstrikes in Southern Idlib and Northern Hama Provinces, despite the relative calm along the front lines. Russia likely intends to leverage this relative calm to free pro-regime manpower and air assets for the anticipated ground operations in Eastern Ghouta. The Russo-Iranian Coalition successfully leveraged de-escalation zones under the same framework in order to intensify their operations against ISIS and the U.S. Anti-ISIS Coalition in Eastern Syria in 2017. “TSK konvoyu, yeni gözlem noktası için İdlib’e intikal etti,” Anadolu Agency, February 9, 2018, http://aa.com(. )tr/tr/gunun-basliklari/tsk-konvoyu-yeni-gozlem-noktasi-icin-idlib-e-intikal-etti/1059152; “Turkey army moves to set Syria ceasefire observation point,” Yeni Safak, February 15, 2018, https://www(.)yenisafak.com/en/world/turkey-army-moves-to-set-syria-ceasefire-observation-point-3114742. This series of graphics marks the latest installment of our Syria SITREP Map made possible through a partnership between the Institute for the Study of War and Syria Direct. 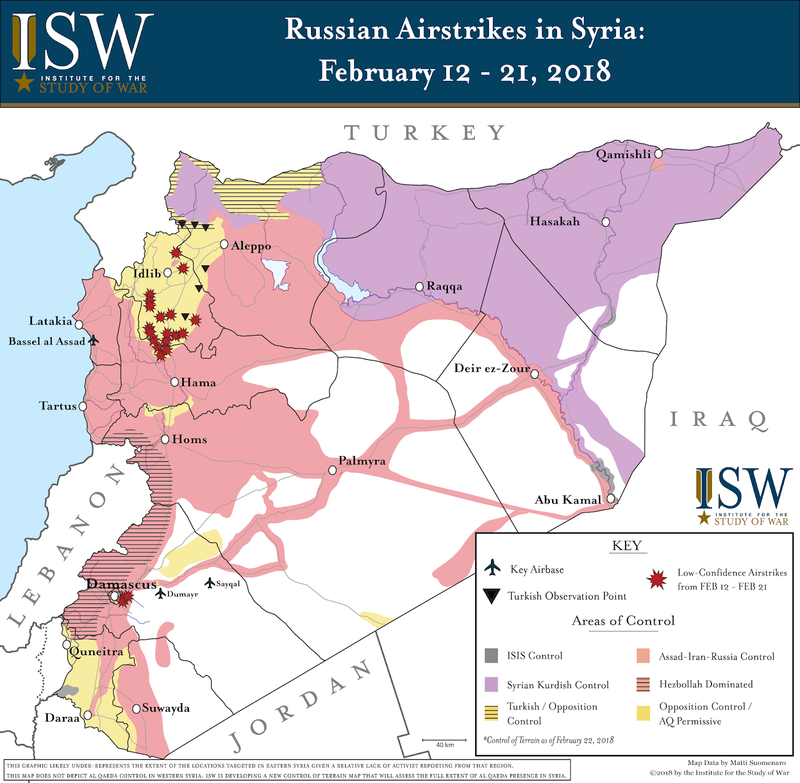 These graphics depict significant developments in the Syrian Civil War from February 7 - 21, 2018. The control of terrain represented on the graphics is accurate as of February 22, 2018. 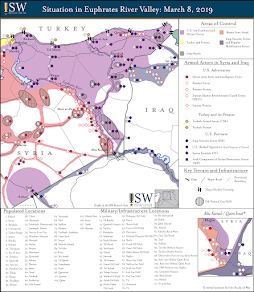 Special credit to Sana Sekkarie of the Institute for the Study of War for the text of these Syria SITREP Maps. Pro-regime forces including Russia and Iran have launched an offensive to clear the besieged opposition-held Eastern Ghouta Suburbs on the outskirts of Damascus. 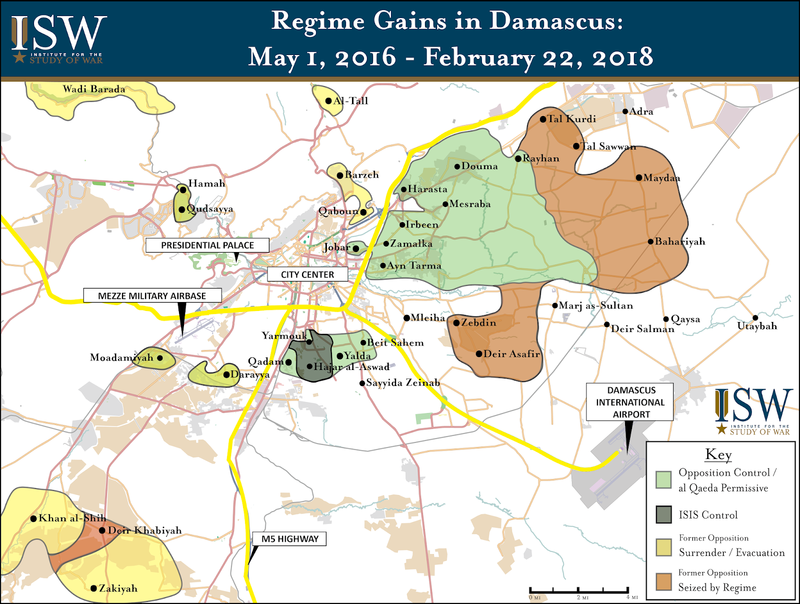 This graphic depicts the military situation in Damascus as of February 22, 2018. This graphic only depicts control of terrain changes that occurred after May 1, 2016. Key Takeaway: The Russian Wagner private military company and Lebanese Hezbollah attacked U.S. and partner forces in Eastern Syria on February 7, 2018. Wagner is part of the business empire belonging to Putin ally Evgeni Prigozhin, whom Special Counsel Robert Mueller indicted on February 16. The Kremlin uses proxy forces in Ukraine as well as Syria to maintain plausible deniability and avoid accountability for aggressive actions abroad. A proxy directly attacking U.S. forces is a significant escalation in the Kremlin’s use of irregular forces. The U.S. responded tactically in self-defense, but Secretary of Defense James Mattis did not hold Russia accountable, questioning whether Moscow had ordered the attack. The U.S. failure to hold Russia accountable and respond strategically to this attack sets a dangerous precedent, enabling the expansion of Russian proxy warfare. The Kremlin can use deniable proxies to attack U.S. forces and partners in other theaters, such as Eastern Europe and the Baltics. The Russo-Iranian military coalition supporting the regime of Syrian President Bashar al-Assad used a Russian private military company to launch a coordinated attack on U.S. and partner forces in Eastern Syria. Several hundred pro-Assad regime fighters launched a coordinated attack against a base occupied by U.S. and Syrian Democratic Forces (SDF) – the main U.S. partner in Syria - in Eastern Deir ez-Zour province on February 7. Russian private military company (PMC) Wagner participated in the attack. The Kremlin officially denied knowledge of the assault and employed an information operation to muddle the true narrative of the event. Russian military officials maintained contact through ‘deconfliction’ channels with U.S. forces throughout the attack, while denying that they knew that Wagner and its Lebanese Hezbollah partner forces had engaged. Russia thereby sought to obscure its role in the attack. The Kremlin has subsequently obfuscated the number of Russian mercenaries involved, the number killed, and the motivation for the attack using techniques common to Russia’s information campaign in Ukraine. The Kremlin nevertheless likely knew of and permitted the attack on U.S. and partner forces on February 7. The Kremlin has used proxy forces in the past to maintain plausible deniability and shed accountability for aggressive actions abroad. 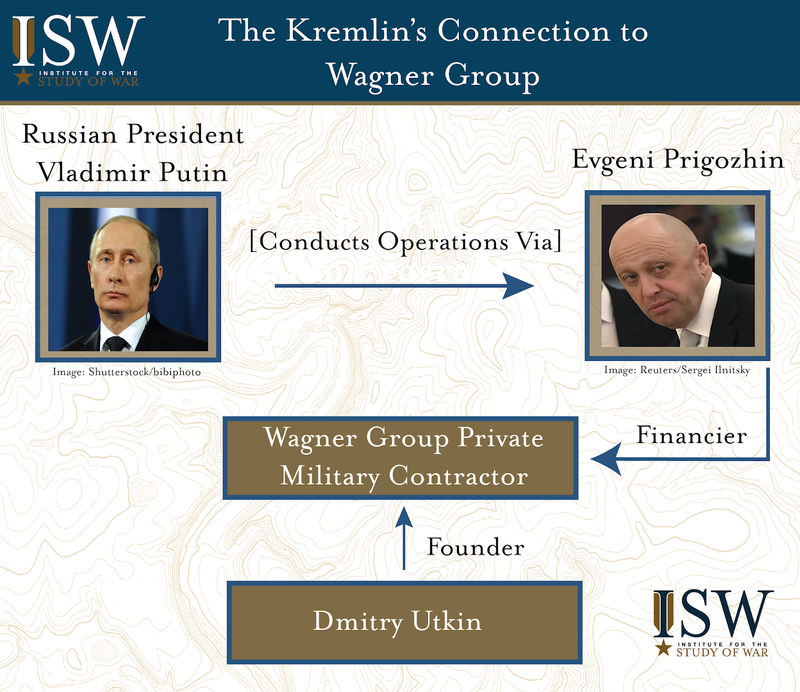 Wagner is a private military company with close ties to the Kremlin and Russian military forces. Dmitry Utkin – a former Russian special forces officer – founded the company. Wagner reportedly trains recruits at a shared base with Russian Special Forces near Molkino, Russia. It has played an important role supporting Russian military operations. Wagner operated as a Kremlin proxy in Ukraine, fighting alongside Russian-backed separatists and in coordination with the Armed Forces of Russia. Wagner deployed to Syria in 2015 and played a key role in the Russia-backed offensives to retake oil-rich areas in Palmyra and Deir ez-Zour Province from the Islamic State of Iraq and al Sham (ISIS). The Russian Ministry of Defense has provided direct support to Wagner in Syria through both arms and transport. The indictments handed down by U.S. Special Counsel Robert Mueller significantly reduce the plausibility of attempts to deny Kremlin control over Wagner's actions. Russian businessman Evgeni Prigozhin is a close ally of President Vladimir Putin and a known associate of Dmitry Utkin. His business empire includes Wagner. 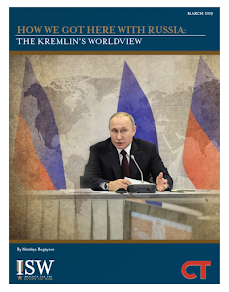 The Kremlin leverages Prigozhin's businesses as a proxy tool to achieve various foreign policy objectives while maintaining plausible deniability. Special Counsel Mueller indicted Prigozhin for attempting to undermine the 2016 U.S. presidential election on February 16, 2018. Prigozhin served as the financier of a company that purchased private networks in the U.S. to establish fraudulent social media profiles allegedly posing as U.S. persons in order to defraud U.S. elections according to the indictment. The Kremlin likely benefits economically from Wagner’s involvement in Syria as well. Utkin commands Wagner in seizing and securing Syrian oil fields in Eastern Syria. The Prigozhin-led company Evro Polis signed a contract with the Syrian regime’s state-owned petroleum company. The contract allocates 25 percent of all revenue from oil and gas facilities in Syria seized with the assistance of Russian forces to Evro Polis. These revenues are likely channeled to support the Putin regime. The U.S. failure to hold the Kremlin accountable for its mercenaries' attack on U.S. and partner forces sets a precedent that the Kremlin will likely exploit in Syria and in Eastern Europe. The U.S. response to the pro-Assad regime attack on February 7 will not be enough to deter Russia from the future use of proxies, despite its tactical success. The U.S. has previously failed to hold the Kremlin accountable for the actions of its proxy forces against Ukraine, encouraging Moscow to expand its use of this tool. The U.S. response to the February 7 attack further signals to the Kremlin that it will not be held accountable for the actions of its proxies – beyond a tactical cost – even when those proxies directly threaten American forces. Key Takeaway: A genuine U.S.-Turkey rapprochement will require Turkey to counter al Qaeda in Syria. The U.S. and Turkey released a joint statement on February 16, 2018 during Secretary of State Rex Tillerson’s trip to Ankara that expressed resolve to fight against terrorists, including al Qaeda. Yet Turkish President Recep Tayyip Erdogan has been expanding Ankara’s partnership with al Qaeda in Syria. Future negotiations with Turkey over political and security structures in Syrian Kurdish-dominated terrain, which will start with Manbij according to Secretary Tillerson, may de-escalate tensions. A broader U.S. effort to realign with Turkey in order to achieve American objectives will not survive Erdogan empowering al Qaeda in Northern Syria, however. Turkey launched the main effort of its campaign against the Syrian Kurdish People’s Protection Units (YPG) in the Afrin District of Northern Syria. Turkey and Turkish-backed opposition forces started a new cross-border military push to seize the town of Jinderis southwest of Afrin City on February 9, 2018. This line of advance likely represents the main effort to isolate Afrin City, as previously assessed by the Institute for the Study of War (ISW). Turkey and Turkish-backed opposition forces have also continued clearing operations on multiple axes along the Syrian-Turkish border. Turkey launched its main effort after renegotiating the terms of its air operations in Northern Syria with Russia. Russia temporarily denied airspace access to Turkey over Northern Syria after al Qaeda affiliate Hay’at Tahrir al Sham (HTS) shot down a Russian Su-25 in Idlib Province on February 3. This downing triggered a flurry of bilateral diplomatic engagements between Russia, Iran, and Turkey. Russia reportedly demanded the handover of the deceased pilot and access to the crash site in return for reopening the airspace to Turkey. Turkish-backed opposition fighters delivered the pilot to Russia via Turkey on February 6. Russia later allowed Turkey to resume its air operations in Afrin Canton on February 9 following a conversation between Turkish President Recep Tayyip Erdogan and Russian President Vladimir Putin on February 8. Turkey is attempting to exploit Russia’s desire for a ‘de-escalation’ zone in Idlib Province to reinforce Turkish leverage in Syria. The Turkish Armed Forces established two forward operating bases near the towns of Tel Touqan and Surman in Eastern Idlib Province on February 9 and February 15, respectively. The deployments follow the establishment of a similar outpost by Turkey at al Eis in Eastern Idlib Province on February 5 despite earlier resistance from pro-Bashar al Assad regime forces. Pro-regime targeting of the Turkish convoy indicates Turkey conducted the deployments outside of negotiated parameters for the de-escalation zone. However, Putin seeks to preserve the de-escalation zone at the cost of tensions with the Bashar al Assad regime and Iran. Russia shifted its air campaign away from the frontlines in Eastern Idlib Province after February 3 to allow Turkey’s deployment to its observation posts in Eastern Idlib Province. This shift occurred after HTS shot down the Russian Su-25. It underscores Putin is willing to abate hostilities in Idlib in order to avoid incurring significant setbacks ahead of Russian elections on March 18. Russian military police reportedly established their own forward base adjacent to Turkey’s near al Eis on February 15 to deter Iranian or Assad regime provocations against Turkey. Erdogan is willing to provide intelligence to al Qaeda-linked forces to disrupt pro-regime expansions and degrade YPG defenses. Turkey continues to prioritize its objectives to replace the Assad regime with a government friendly to Turkey’s interests and to eradicate a safe haven for the YPG’s Turkey affiliate—the Kurdistan Workers’ Party (PKK)—in Syria. Turkey prioritizes these objectives over U.S. counterterrorism goals against ISIS or al Qaeda. Turkey supported the formation of a new joint operations room to consolidate opposition groups against a pro-regime offensive in Eastern and Southern Idlib Province on February 3. The ‘Repelling the Invaders’ Operations Room includes participation from Syrian Salafi-Jihadist groups including Ahrar al-Sham—a historic Turkish client—and may be orchestrated by HTS. Turkey may have provided intelligence to al Qaeda-aligned group Nour al Din al Zenki that led to Zenki’s interdiction of two arms shipments traveling to YPG forces defending Afrin. Zenki forces are also reportedly participating in Turkey’s offensive in Afrin. Turkey deepened cooperation with al Qaeda to halt the pro-regime offensive in Idlib Province. 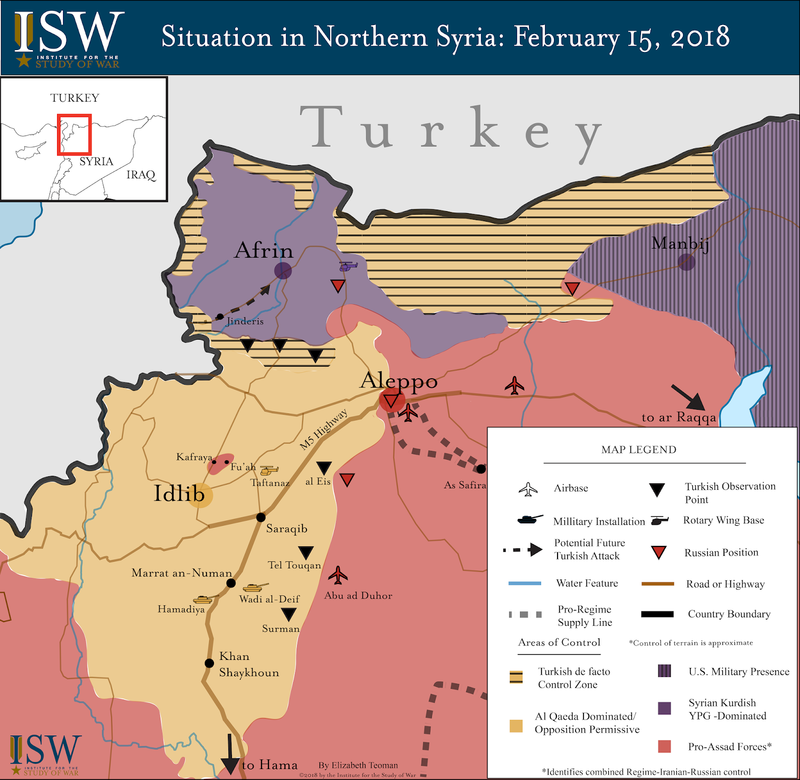 ISW previously assessed that Turkey aimed to impose high costs on pro-regime forces and ultimately block their advance deeper into Idlib Province. Pro-regime forces halted their military operations in eastern Idlib Province on February 9. These changes reflect Turkey’s success in leveraging military pressure to compel a halt to the pro-regime offensive. Turkey’s positions are near frontlines with pro-regime forces and enable Turkey to block future pro-regime offensive operations deeper into Idlib Province. Turkey coordinated its establishment – and likely defense – of its bases in Idlib with HTS. Turkey relies upon al Qaeda-linked forces for force protection and logistical resupply of vulnerable positions in Idlib. Turkey is on track to expand its cooperation with and empowerment of al Qaeda in Syria. Turkey has reportedly also inspected former regime military bases in Ma’arrat al-Numan and Taftanaz farther south in Idlib Province. Turkey may establish additional positions at these facilities in the coming weeks. Turkey’s actions in Syria make a true rapprochement with the U.S. increasingly difficult. Turkey is fostering al Qaeda’s consolidation in Northern Syria. Turkey’s deployment deep into Idlib will preclude Turkey from actively supporting possible future U.S. operations against al Qaeda in Syria. Turkish forces in Idlib would be immediately vulnerable to al Qaeda counter-escalation. Turkey’s logistical support to its forward bases in Idlib Province also transit through al Qaeda-held terrain. This vulnerability nullifies the U.S. strategy to outsource a counter-al Qaeda strategy to Turkey. The U.S. must address Turkey’s drift into a partnership with al Qaeda as a priority even while U.S. officials focus on near term de-escalation between Turkey and the YPG in Manbij in Northern Syria. New deployments of Russian troops to Idlib to accompany Turkish deployments would further draw Turkey, a NATO alliance member, into a military partnership with Russia and complicate any future U.S. operations against al Qaeda in Northern Syria. “'Operation Olive Branch' to Afrin,” Anadolu Agency, February 11, 2018, http://aa.com(.)tr/en/pg/photo-gallery/new-batch-of-military-vehicles-are-deployed-in-border-province/0#. Afrin'e hava harekatına Rusya engeli... 4 Şubat'tan bu yana hava operasyonu yapılmıyor,” Cumhuriyet, February 8, 2018, http://www(.)cumhuriyet.com.tr/haber/turkiye/922078/Afrin_e_hava_harekatina_Rusya_engeli..._4_Subat_tan_bu_yana_hava_operasyonu_yapilmiyor.html. 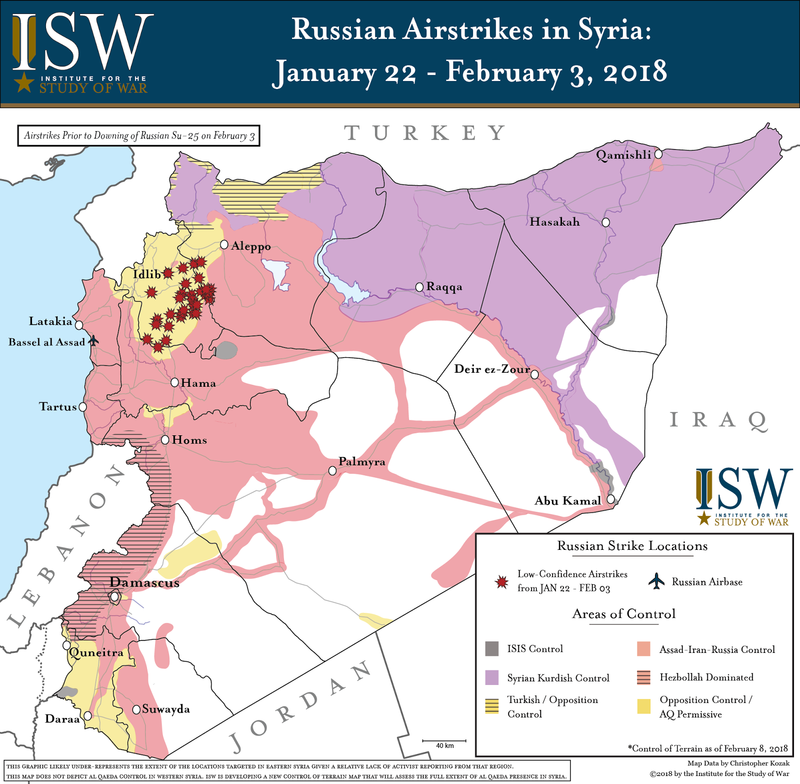 Russia prioritized its air support for a major pro-Bashar al-Assad regime ground campaign into Idlib Province between January 22 and February 11, 2018. The Russian Armed Forces focused its air operations in support of a wider pro-regime ground campaign to capture terrain in opposition-held Greater Idlib Province. Russia enabled a successful pro-regime offensive that seized full control of the Abu Dhuhur Airbase in Eastern Idlib Province on January 20. Russia subsequently supported a pro-regime advance towards the town of Saraqib in Idlib Province that began on January 31. Russia conducted heavy airstrikes targeting opposition-held villages along pro-regime frontlines across Eastern Idlib and Southern Aleppo Provinces. Russia also launched near-daily air raids against Saraqib itself that prompted the opposition Saraqib Local Council to declare a ‘disaster zone’ in the town. Saraqib occupies a strategic position along the M5 Highway that would provide an ideal staging ground for future pro-regime operations to reach Idlib City or the besieged pro-regime enclave of Fu’ah and Kefraya – two majority-Shi’a villages that represent a key Iranian priority in Syria. Russia adjusted its air operations after the combat loss of one of its warplanes in early February. Hay’at Tahrir al-Sham (HTS) – Al-Qaeda’s affiliate in Syria – claimed responsibility for the downing of a Russian Su-25 ‘Frogfoot’ near Saraqib with a Man-Portable Air Defense System (MANPADS) on February 3. The Russian Armed Forces in response ordered all warplanes to increase their flight altitude outside the range of potential MANPADS. Russia also reportedly deployed new electronic air defense and surface-to-air missile systems to Northern Syria. Russia simultaneously launched a punitive air campaign targeting key civilian infrastructure across Greater Idlib Province including Idlib City and Jisr al-Shughur on the Syrian-Turkish Border. Pro-regime aircraft also intensified their air and artillery bombardment of the opposition-held Eastern Ghouta Suburbs of Damascus, killing at least 200 civilians. Russia likely participated in these strikes, although ISW could not validate a low-confidence strike during the reporting period. Russia is leveraging the operational effects of its air campaign to shape ongoing strategic negotiations with Turkey in Northern Syria. Russia likely enabled the pro-regime offensive on Saraqib in part to pressure Turkish President Recep Tayyip Erdogan to adhere to prior commitments reached at the Astana Talks. Russian President Vladimir Putin reportedly urged Erdogan to expedite the deployment of observation posts by the Turkish Armed Forces in Northern Syria on January 31. Russia later deliberately shifted its air campaign in order to allow Turkey to establish two outposts in Eastern Idlib Province on February 5 and February 9. Russia nonetheless sustained – if not intensified - its indiscriminate air campaign against opposition groups backed by Turkey in Idlib Province. Russia will use its air assets as both an enabler and a deterrent to shape the long-term future of Northern Syria in negotiation with Turkey, Iran, and Syria. Iraq’s Independent High Electoral Commission (IHEC) extended the submission deadline for electoral list coalition candidates from February 10 until February 15. The candidate lists determine how seats will be allocated after the election on May 12, 2018. Political alliances have become unusually fluid since January 11, IHEC’s official deadline for alliance formation. The extension gives additional time for electoral list coalitions to establish the order and quota of member parties on their candidate lists. The bonus week also allows parties to split and join electoral list coalitions unofficially by coordinating their candidate list submissions. IHEC may also bend to political pressure and allow legal means for alliances to form officially. Political alliances show signs of upcoming change. Kurdish political parties met on February 6 to discuss the formation of a unified electoral list to run in Iraq’s disputed territories in upcoming elections. Kurdish parties are attempting to overcome internal divisions to run on a unified list in oil-rich Kirkuk Province. Separately, Sunni Al-Watan al-Iraqi (Iraqi Homeland) party leader Mishan al-Jubouri of Salah al-Din Province announced his party’s intention to join Vice President Ayad al-Allawi’s Itilaf al-Wataniyah (National Coalition) electoral list on February 8. Jubouri split from the Hadi al-Amiri-led Tahalaf al-Fatah (Conquest Alliance) on January 16. Iraqi Prime Minister Haider al-Abadi will use the additional week to form a consensus on Itilaf al-Nasr (Victory Coalition) candidates after Ammar al-Hakim’s political bloc split on January 29. ISW detailed Victory Coalition fractures on February 2. Key Takeaway: America's adversaries in Syria are using military force to undermine U.S. forces and their partners. The Russian and Iranian military coalition backing Syrian President Bashar al-Assad coordinated a major attack against the U.S.-led Anti-ISIS Coalition in Eastern Syria. The U.S. responded tactically by striking its attackers in self defense, stopping the offensive. But this tactical success demonstrates that U.S. strategy in Syria is failing. Russia and Iran seek ways to capitalize on U.S. failures and act to constrain, disrupt, and ultimately expel the U.S. from Syria and the Middle East. Turkey, meanwhile, has invaded Syria to challenge Kurdish forces, some of which the U.S. backs. The U.S. risks losing the gains it has made fighting ISIS to Russia and Iran. Russia and Iran intentionally attacked U.S. and partnered forces in Eastern Syria. Several hundred pro-Syrian regime fighters launched a “coordinated attack” against the Syrian Democratic Forces (SDF) – the main U.S. partner in Syria – in Eastern Deir ez-Zour province on February 7. The U.S. has long had its own military personnel in the base. The U.S. responded with successful force protection strikes. The U.S. must help stabilize Eastern Syria in order to prevent ISIS from returning to its stronghold in Ar-Raqqa City, from which anti-ISIS coalition drove the terrorist organization in late 2017. The U.S. is using its primary ground partner – the predominantly Kurdish Syrian Democratic Forces (SDF) – to restore some semblance of civilian life in formerly ISIS-held terrain. U.S. military personnel advise these partners. These efforts also serve to contain the influence of Russia and Iranian proxies in Eastern Syria, which the U.S. has partially constrained to the south side of the Euphrates. Russia, Iran, and the Syrian regime planned the operation in advance. They began preparing the attack weeks in advance and aimed to increase Iranian presence east of the Euphrates River in order to seize valuable oil and gas fields. Russia and Iran have for months sought to reintegrate by force critical areas in Eastern Syria held by the SDF - including Ar-Raqqa City as well as key oil and natural gas fields in Eastern Syria - back into the Assad regime. The oil and gas fields are critical for stabilizing the Syrian economy and Assad's regime. They also provide a source of revenue for these Russian and Iranian efforts. Russia used proxy partners and official messaging to obfuscate its involvement, using a hybrid warfare technique common in Ukraine. Russian private military contractors and Lebanese Hezbollah  participated in the attack. Russian officers maintained continuous communication with U.S. military officials through the deconfliction hotline during the attack in order to obfuscate Russia’s direct role in the incident. Russia both supported the attack and simultaneously gave the impression of genuine efforts to prevent the attack in order to confuse senior U.S. decision makers. U.S. deterrence in Syria is failing. Russian and Iranian-backed forces had already directly challenged U.S. forces and their partners twice in 2017. Russia and Iran conducted similar probing attacks near Ar-Raqqa City and the U.S.-Rebel Base on the Syrian-Iraqi Border in mid-2017 prompting the U.S. to conduct protective strikes. Russia and Iran successfully concluded operations to limit U.S. freedom of movement of in Eastern Syria, including the seizure of Abu Kamal on the Iraqi-Syrian Border in November 2017. The U.S. Anti-ISIS Coalition is also struggling to deter similar attacks by Turkey against U.S. partners in Northern Syria. The U.S. has forces deployed between Turkish-backed forces and U.S. partners near Manbij in Northern Syria in order to deter an expansion of Turkish operations. Senior U.S. officials are conducting diplomatic visits to Turkey to negotiate a de-escalation of territory around Manbij as a future flashpoint between Turkish-backed forces and U.S. partners. Turkish military operations in Northern Syria have created opportunities that Russia and Iran tried to exploit. The Turks invaded Syria’s Northern Afrin region on January 20 to oust from the area Kurdish forces, some of which are fighting an insurgency against Turkey. The Syrian Democratic Forces (SDF) in Eastern Syrian and other Kurdish forces consider losing a primarily Kurdish district to Turkey as an existential threat. SDF reinforcements have therefore deployed to northwestern Syria in order to defend Kurdish-majority Afrin. These reinforcements included the U.S. armed Syrian Kurdish People’s Protection Units (YPG) – the main component of the SDF – and several other SDF-subcomponents including the U.S.-trained Raqqa Internal Security Forces intended to stabilize post-ISIS Ar-Raqqa City. The battle against Turkey in northwestern Syria distracts the SDF from the fight against ISIS in Eastern Syria. The U.S. is drawing down in Iraq and Syria while all other actors are escalating. The four-star headquarters responsible for the Middle East announced on February 7 that the U.S. was drawing down some of its air power and intelligence assets from Iraq and Syria. U.S. Presidents Barack Obama and Donald Trump have tried to isolate the fight against ISIS from the rest of the Syrian Civil War. In contrast, U.S. enemies, adversaries, and even allies correctly see the problems in Syria as intertwined. The U.S. must recognize it cannot sustainably pursue its objectives in Syria without taking into account the objectives of Russia, Iran, and Turkey. The U.S. must formulate a comprehensive Syria policy and commit the necessary resources to accomplish American interests rather than declare arbitrary victory and withdraw.